We’ve spent most of the past eight days camped in the Colorado mountains and now are in a hotel in Delta. We will still camp out a few more nights on the way home to Denver. We’ve seen Great Sand Dunes National Park and Black Canyon National Park. 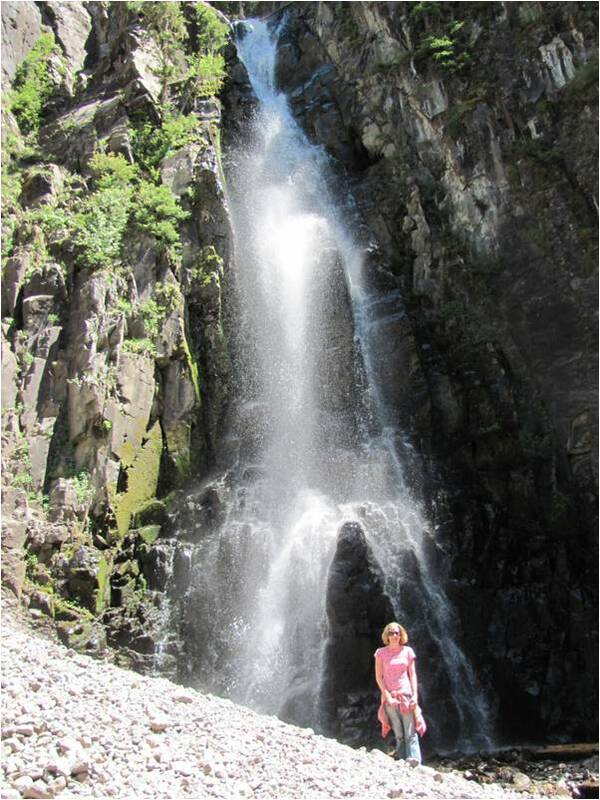 The big surprise of the trip was a hike to beautiful 60+ foot high waterfall that a campground host told us about. We spent a few hours there relaxing in the refreshing spray. It has been interesting and mostly restful without computer or Internet. First, I love the 12th chapter of Isaiah; it is a wonderful song of thanksgiving for salvation. I prayed through this song a few times as I walked the hills near our first campground. It was indeed a time of drawing water from the wells of salvation. “I will give thanks to You, O LORD; For although You were angry with me, Your anger is turned away, And You comfort me. Behold, God is my salvation, I will trust and not be afraid; For the LORD GOD is my strength and song, And He has become my salvation” Therefore you will joyously draw water from the springs of salvation. Second, I was noticing how often Isaiah prophecies of the salvation to come to the Gentiles. “When the LORD will have compassion on Jacob, . . . then strangers will join them and attach themselves to the house of Jacob.” (14:1) “In that day there will be an altar to the LORD in the midst of the land of Egypt, . . . for they will cry to the LORD because of oppressors, and He will send them a Savior and a Champion , and He will deliver them. . . . The LORD will strike Egypt, striking but healing; so they will return to the LORD.” (19:19-22) I was praising God, as I walked around the lake at our second campground, because I am one of the Egyptians, a foreigner to God’s covenant, yet God has graciously visited me with healing and I am one of his people. On Monday I played in the Dignity Memorial Golf Tournament for pastors. Dignity is the largest network of mortuaries and funeral homes in the country, including the Olinger Funeral Homes here in the Denver area. This has become an annual event for me and Pastor Wes, though he is currently out of the country and couldn’t play this year. They put on a great event and treat us like royalty for the day. I had a good time, though the team I played on was terrible, me included! However, I had a great conversation there. While waiting for the tournament to begin, I was approached by a familiar face; it was Michael Walker, pastor of Church in the City. Though neither of us could figure out where we’d met before, he did introduce me to his teammate Bill McCartney, the former football coach at Colorado University and founder of Promise Keepers. Since I was on the team immediately in front of them, and since the tournament ran slow at times, I was able to visit with them occasionally as we waited on the groups in front of us. When the tournament was over and lunch was served, I looked for a place to sit and, not finding anyone I knew, saw Coach Bill and another teammate of his sitting alone, so I asked if I could join them. The other teammate turned out to be Raleigh Washington, the President of Promise Keepers, and they were talking about some statistics Raleigh heard from AWANA. He understood that 90% of kids that finished the 4th through 6th grade program in AWANA remain in the church many years later, and he compared that to the 80% of kids in traditional youth programs that fall away from the church. Though Raleigh hadn’t verified these numbers (and I haven’t either), he said if they are even half correct then there is something AWANA is doing right that needs to be pushed. Coach McCartney said they are considering how to encourage AWANA programs for the children of men in their movement. As a pastor, and parent, who has been involved with AWANA, I found the discussion encouraging, and was able to give some input from my perspective, including how much work the program requires of participants and how few actually finish it. Promise Keepers is asking how they can effectively persuade the next generation to mediate daily on God’s Word. As Coach said, after quoting from Psalm 1, “the church will be only as successful as its people are consistent in God’s Word.” This sounds like a great development to me. May God bless it! Did Jesus Want to Remain Unknown? I am reading through Luke these days and have a question I was wondering if you could answer. In Luke 4, Luke talks about Jesus in Galilee, how he was healing everyone around and freeing many from demonic possession. When the demons would claim he was God, why did Jesus not want them telling others who he was? Why did he want to remain unknown? I appreciate your questions and your sharp observation. I am encouraged when young people are spending time in God’s Word. The short answer is that Jesus didn’t want to be known as “Messiah” or “Son of God” by the Jews, because they would misunderstand him. There is not a contradiction or inconsistency in Jesus. The difference between these two stories is in location. Every time Jesus asked someone not to tell who he was, he was in Jewish territory. The Jews had a misunderstanding of what the Messiah would come to do. They were looking for a political leader, and Jesus didn’t want them to have that misunderstanding about him. He came to die for sins, not to lead a political freedom campaign against Rome. When the people began to believe he was the Messiah, strange things happened. In John 6, after he fed 5,000 of them, the people planned to “make him king by force!” That was not the divine plan! Every time Jesus permitted someone to tell about him, he was in a non-Jewish area. The demoniac in Mark lived in Decapolis – a Greek name meaning “ten cities.” Since they had no conceptions about what the Messiah would come to do, Jesus didn’t have the same concern. Specifically, looking at the words of demons, the same reason would apply. In fact, you’ll notice that Jesus didn’t quiet the legion of demons in Decapolis, rather he had a conversation with them! But there is another issue at work as well. The Jewish people understood demon possession in an experiential way: they saw it and believed it to be real. They knew the source of demonic activity. Satan is a liar and the father of lies, and even when he tells the truth, he does it to ultimately deceive. So Jesus wouldn’t want the people to hear what demons had to say about him. The same thing happened with Paul and Silas in Acts 16. I hope this helps. Stay in the Word! Once again it is imperative to check the tenses in the New Testament when God tells us what is true about us and what has been or will be accomplished for us. Ignoring those tenses leads to a false theology and a lack of genuine security. Last week I was reading Hebrews and was struck by these phrases: “Through his own blood he entered the holy place once for all, having obtained eternal redemption.” (9:12) And “by one offering he has perfected for all time those who are sanctified.” (10:14) Notice that Jesus has already obtained eternal redemption, and if it is eternal, nothing can change or destroy it. Notice that Jesus as already perfected those who are sanctified, and if perfected by him, nothing can pollute them. These verses are similar to others that tell us we have eternal life now; that we are justified now; that we have been redeemed already. The last time I talked to my Jehovah Witness friend, he told me that sin includes even bad attitudes we have, and that we all sin almost every day. He told me that Jesus death and resurrection is their biggest celebration because it gives them the opportunity to be forgiven. Jesus died so we can live up his expectations and receive forgiveness. So I asked him if Jesus has forgiven the sin he will commit tomorrow. He said he hoped he wouldn’t sin tomorrow, so I pressed the question with, “You will sin, by your own definition, if not tomorrow, then certainly the next day. Has Jesus forgiven that sin?” He had no answer. If he’d said yes, then I would have asked why he has to live up to Jesus’ expectations to be forgiven, and if he’d said no, I would have asked how Jesus could forgive any of his sins, since they were all future when Jesus died. The biblical truth is that Jesus obtained eternal salvation when he died. My friend has no security; but the biblical truth tells me that those who trust Jesus are eternally secure. I haven’t seen my friend since that day, but I’ve often prayed that my question will make him uneasy with his understanding, so he will see the biblical truth. Jesus paid it all!